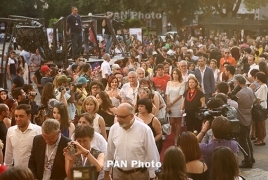 PanARMENIAN.Net - The Golden Apricot Yerevan International Film Festival (GAIFF) launched in Armenia Sunday, July 10. The first day of the festival started with press conferences: Armenian Panorama participants Garegin Papoyan (Skhtorashen), Lusine Papoyan (Radio receiver) and Evelina Barsegian (Bravoman) gave detailed presentations of their films. On the second half of the day, a non-official start - apricot blessing ceremony – took place at St. Zoravar church. Honorary stars of cinematographer Albert Yavuryan, directors Edmond Keosayan and Dmitry Kesayants were unveiled at Charles Aznavour square among other prolific masters of the Armenian cinema, with Armenia's Police Brass Band performing during the ceremony. The festival was officially launched in the evening at Moscow Cinema, followed by a red carpet ceremony. Welcoming speeches were made by GAIFF General Director Harutyun Khachatryan and VivaCell-MTS General Director Ralph Yirikian. The company has served as GAIFF's general sponsor for ten years. The Academy has decided to establish a list of Treasures of European Film Culture, much like the UNESCO World Heritage list, summing up places of historical cinematic value that need to be maintained and preserved for generations to come. At the end of the ceremony, the opening film by celebrated Armenian filmmaker Hamo Beknazaryan, “Zare,” was screened with Vahagn Hayrapetyan’s live performance, specially composed for the film.